Have a question about the Trident Split Mask Strap Cover? Strap Wrapper with Velcro style opening along the bottom allows easy installation onto the existing rubber strap! 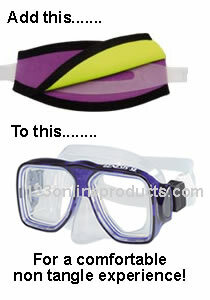 Upgrade your existing rubber mask strap to one that won-t pull or tangle your hair. Mask not included. I love strap covers for my dive mask. Saves my hair and makes the mask easy to pull on and off. I struggled with finding a good one that wasn't so complicated to install. I have different colors I use for different dives (working with students I want to be visible) On my fun trips I like silly sayings or when wearing different  color wet suits I like to match! This is an amazingly easy wrap to install!!! I have a smaller head and was worried it would be too long. It is perfect! On the smallest setting for my mask, it meets end to end on the wrap! The wrap unfolds and you wrap it around (make sure to tuck the excess strap, always hate how they flop around!) and then fold it back over and the velcro is along the entire seam so it stays very secure! It slides easily on and off my head. I rarely wear a hood, but I tried it with my hood and it was even better! Great product and shipping was so fast!